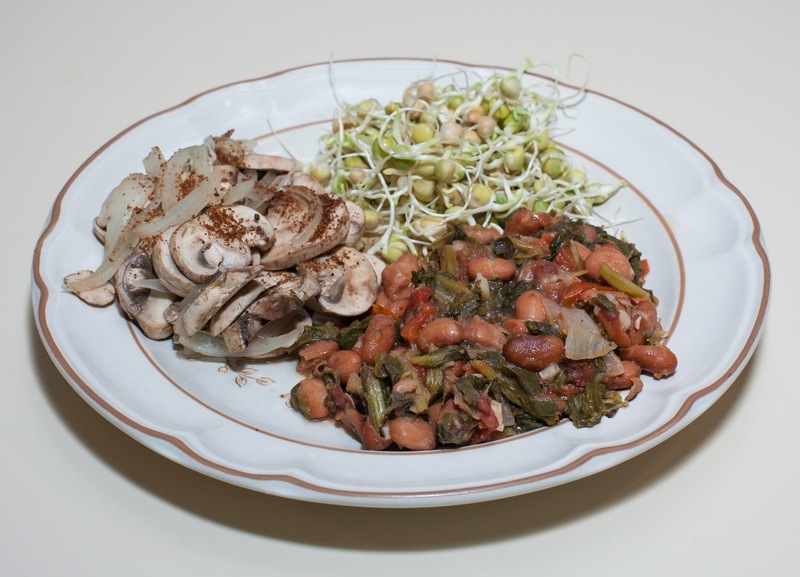 Among meals that I delivered to a client yesterday was a cranberry bean with turnip greens and diced tomato dish; I made a large quantity, enough to save a large serving for us. I didn't capture the details, but the recipe went something like the following. I soaked maybe 2 cups of cranberry beans overnight, rinsed, and cooked for 30 (or maybe 32) minutes on high pressure in my Instant Pot pressure cooker. After a half hour or so, I opened the pot, mixed in a large 28 ounce can of roasted and diced tomatoes, about 2 teaspoons of lime juice, and just a little salt (I always undersalt or skip salt for this client; I find that salt is welcome with acidic foods, but respect clients' desire to set their own salt level). Today, I wanted to add onions and garlic. Instead of heating the dish conventionally, I put the leftovers I saved for my family, along with about 1/8 cup of water, 2 minced cloves of garlic, and maybe 1/4 cup of chopped (maybe 3/8" cubes) onion, into my pressure cooker. Before cooking, I also put in a bowl with 8 ounces of mushroom, maybe 2 or 3 tablespoons of water, and maybe 3 tablespoons of 1/4" x 3/4" or so half moon onions. I cooked on high pressure for 2 minutes. I added some salt, lemon pepper, and garam masala to the mushroom, and served, along with sprouted green peas. My wife said that she enjoyed dinner; it was good, but I think the mushroom in particular could have used more spices, perhaps some turmeric and hot chili powder. The bean dish was good but could have used some additional vegetables, like potato or bell pepper. I should try more simple pressure cooked mushroom recipes. Variants of the beans with additional vegetables would be good. This was the first time in years that I've cooked with turnip greens - I prefer spinach, but changing things up a bit is also good. My wife was out with a friend, so I was just cooking for my daughter and myself. My daughter wanted soup and picked out ingredients - tofu, miso, and carrot. We also had frozen vegetables that she wanted, Brussels sprouts, green peas, corn, and baby lima beans. I just put all of these ingredients and water into my Instant Pot pressure cooker and cooked for 5 minutes. When I was ready to serve, I added a little salt and dried oregano. I also spread some tomato paste on whole wheat bread, topped it with nutritional yeast, and heated for about 4 minutes at 350°F in my toaster oven. 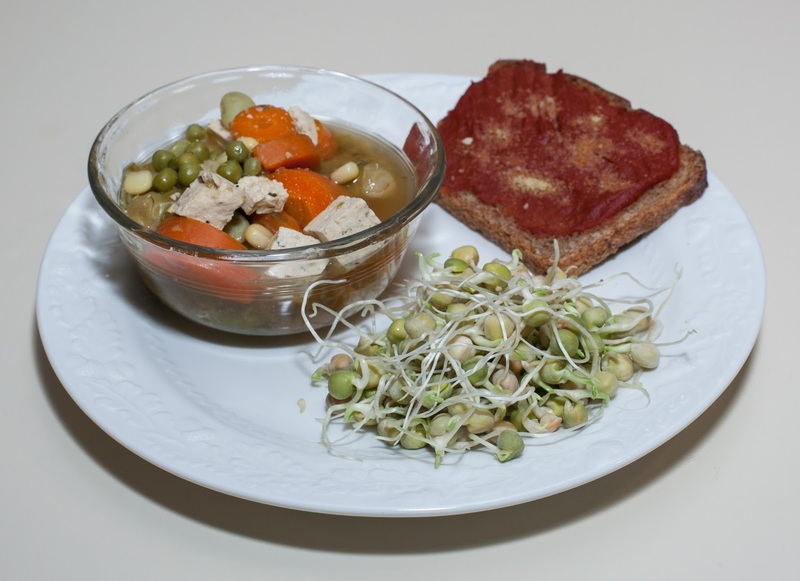 Sprouted green peas completed the meal. I was happy to see how much my daughter enjoyed this simple and nutritious meal. I'll have to make more soups with her direction! The Brussels sprouts were perhaps too soft, even though they started off frozen; I should try a 3 minute pressure cook time with frozen Brussels sprouts. Tonight, it was dinner for just my daughter and me. 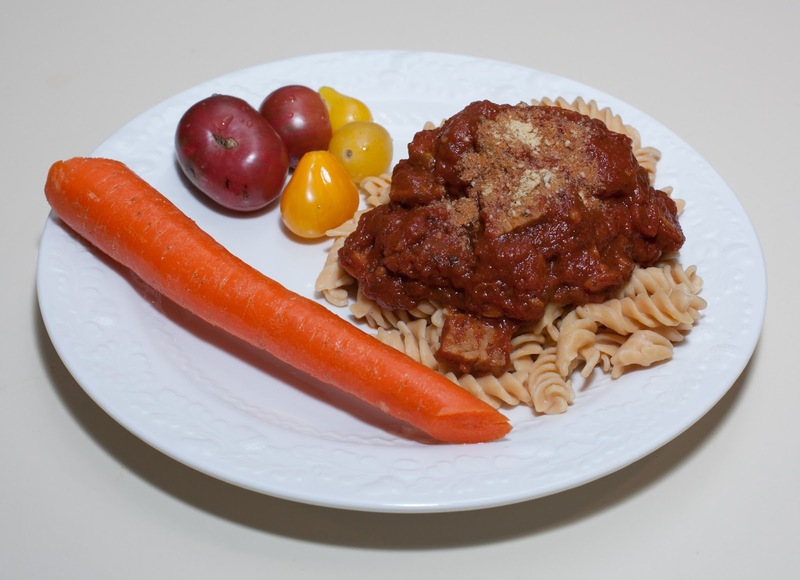 I had a little bit - enough for the two of us - of the Tolerant brand red lentil rotini that I described on March 31. I served a simple pasta with smoky maple tempeh mixed into marinara atop the rotini. 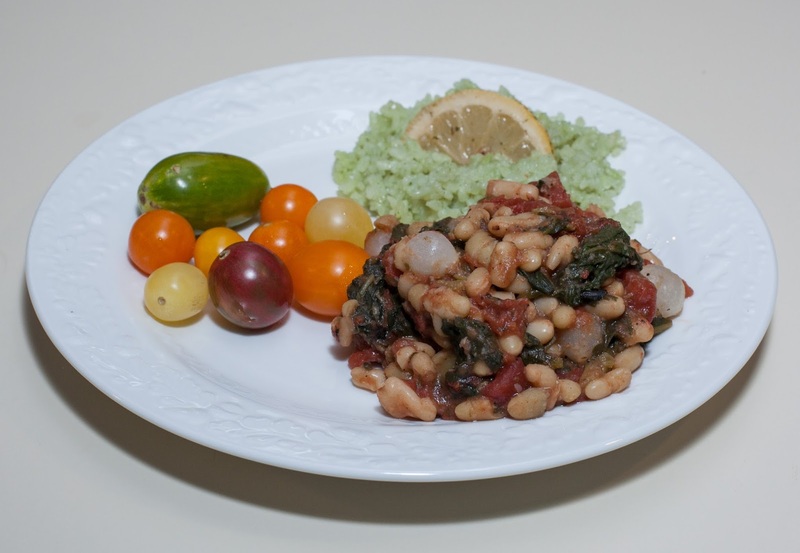 For today, I thought I'd make a flageolet bean dish; I enjoyed the dish that I had made in May with spinach. 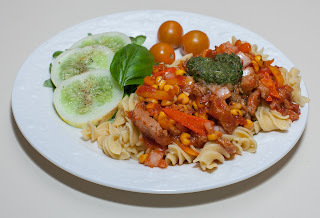 I wanted to make our dinner and also something for a client. The client I was cooking for doesn't eat spice, and my daughter doesn't eat squash. Here is what I did. I rinsed the beans and soaked them in ample water overnight. I cooked hours before I needed to serve so just waited a half hour or so till the pressure was reduced and I could open the Instant Pot. I added the frozen broccoli rabe, as well as the salt, lemon pepper, chopped basil, and lemon juice. I reserved half of the dish into a storage container and mixed in the squash to that container. I'll deliver this to a client. To our half of the dish, I added the onion and another 1/2 t of salt. I also added 1/4 t garlic powder. I put our portion, still in the Instant Pot pot, back in the pressure cooker and pushed the "Keep Warm" button; by the time we would eat an hour or so later, the onion would have warmed up. I also served Jade pearl rice and tasty organic grape tomatoes. All of us loved the meal. I was relieved because sometimes my daughter isn't happy with beans, but she ate all that was served her and happily talked about the meal. Flageolet beans have a nice, mild flavor and are small and easy to combine with other ingredients. I should use 3 cloves minced garlic in the initial cooking and omit the garlic powder. Were I cooking for folks who enjoyed spice and squash, all the ingredients could be used - but this would make nearly twice as much as I usually make for my family. I enjoyed eating fava bean based falafel when I visited Cairo maybe 15 or so years ago. I learned then that falafel is originally from Egypt and not from Lebanon where, of course, chickpeas are used in falafel. I picked up some dry fava beans not for falafel, but because one day I want to make the famous Egyptian ful madames, a hummus-like dip of fava beans with cumin, parsley, garlic, onion, lemon juice, and hot pepper. For today, I thought I'd make something with a fresh tomato and lemon twist. Here is what I did. I cooked the fava beans in boiling water for over 10 minutes, maybe 15 minutes, then drained and rinsed. I had read this trick to have the skin then be easy to peel off. I tried to remove the outer skins, but it wasn't easy; after using my thumbnail and then squeezing, I was able to do it, but it took time. I quit after about a third of the beans and soaked the beans in ample water overnight. The next day after plenty of soak time (14 hours or so), I continued removing skins till they were all done. It wasn't any easier; this time, I tried gently pressing each bean into the knife of a blade and then squeezing the bean out of the skin or pulling the skin away. I had about 2 1/2 cups of beans. I put the beans, garlic, onion, and water into my Instant Pot pressure cooker and cooked on high pressure for 10 minutes. I waited a few minutes then slowly let out remaining pressure and mixed in the tomato, oregano, salt, and lemon juice. 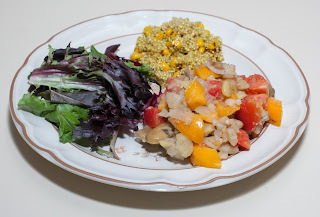 I also served some quinoa with flame-roasted corn kernels and salad greens. Wow! We all loved this. 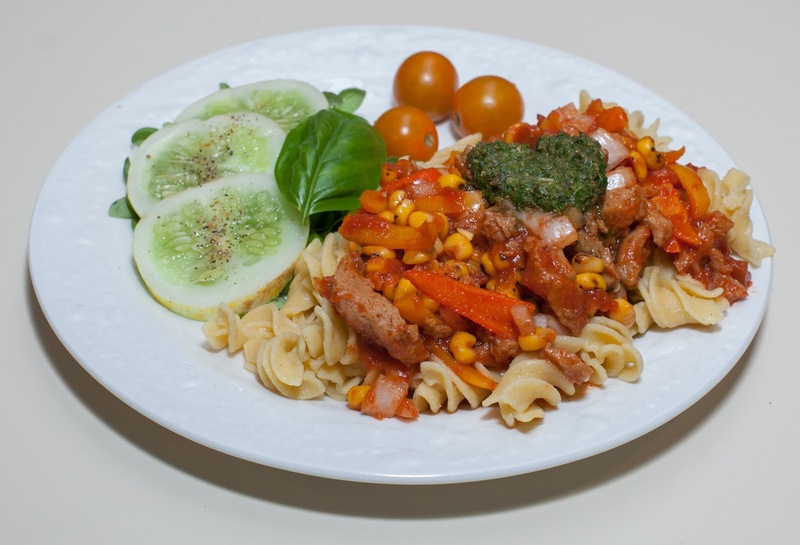 The lemon and fresh tomato really made this a fresh and lively dish. Removing the skins of the beans was time consuming. I wonder if I can find dry split fava beans. I would love to make a ful madames sometime soon. Late last week, my daughter and I loved some lasagna that we found at our new nearby Durham Co-op Market. I picked up some lasagna noodles that were on sale made from rice. Today, we found some beautiful purple cabbage leaves separated from heads of cabbage, and picked them up to be "plates". With my daughter's excited help, I put together a lasagna dinner. Here is what I did. I put the mushroom, bell pepper, spinach, 1 cup of the marinara, and salt into my Instant Pot pressure cooker and cooked on high pressure for 2 minutes. I waited a few minutes then slowly let out remaining pressure and mixed in the seitan, garlic, and onion. I used a 3 quart rectangular casserole dish measuring 13"x9"x2" and spread another cup of the marinara sauce at the bottom. I had 12 lasagna noodles. I made three rows of two noodles (i.e., 6 noodles) at the bottom of the casserole dish. I spooned in about a cup of the filling. On about a third of the surface area, I sprinkled on a little vegan cheese (maybe 3 ounces) for my daughter. I created a layer of single noodles (i.e., three noodles) and put in another 1/2 cup or so of the filling, adding another ounce or so of vegan cheese on my daughter's section. I put on the final three noodles and spooned the remaining marinara (about 2/3 cup) on top. I covered the baking dish and baked in a preheated 375°F oven for half an hour, then served with a light sprinkle of oregano atop a cabbage leaf, along, simply, with a raw baby bok choy leaf and an olive. Wow, we all loved the lasagna and had seconds; I even had thirds! We finished more than 2/3 of what I had made. The noodles could have used a tad more cooking and some of the top layer noodles were hard, needing better sauce coverage and a bit more cook time. The ingredients went quite well together; I offered nutritional yeast and chili powder as optional toppings at the table. My wife was quite surprised that there was no added fat. I tried a small piece of my daughter's with vegan cheese - the ingredients were so rich that the cheese was unnecessary, in my opinion. This is a winner but I could tweak the recipe a bit - not bad for hardly ever having made lasagna before! I should try cooking for 40m next time and should include more sauce, maybe even tomato paste, on the top. A small dollop of pesto added at serving time might be nice. I am glad that I cooked the filling briefly in the pressure cooker, to enhance flavor, before baking the lasagna. I could have included a little garlic in the pressure cooked phase for a roasted flavor, and a bit more garlic overall. My wife has trouble digesting tofu, but otherwise mashed tofu would be a great filling. It's difficult not to think of additional filling ingredients. I'll bet sundried tomato would be nice. 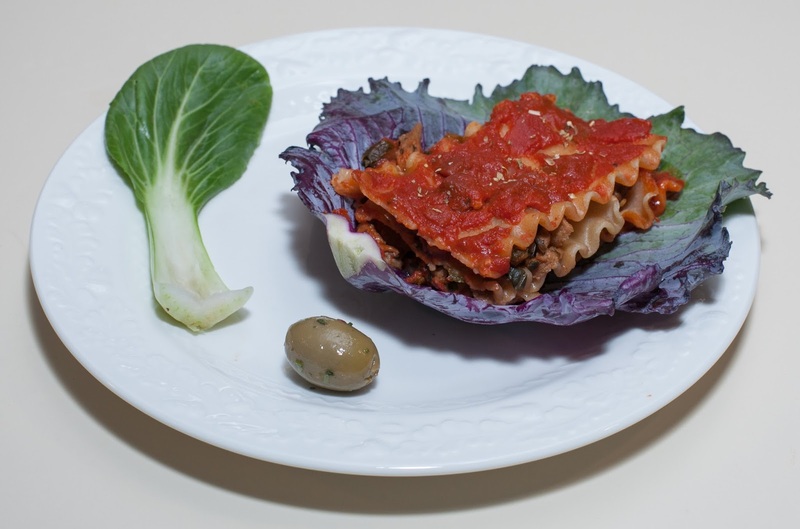 A little sprig of spring onion and bitter radicchio served atop the cooked lasagna would be nice. The rice noodles were nice. 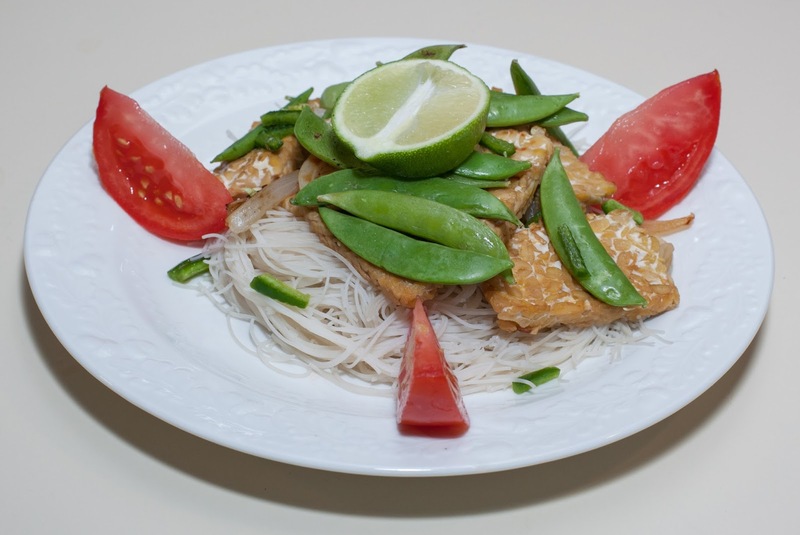 I don't know if I just missed it, but these were made with white rice; I'll bet brown rice noodles are available. We're not gluten averse and I'm happy to use any vegan noodles, particularly if they are on sale :-) . It was fun making the lasagna, especially with my daughter. I'd love to come up with variants and try again with her. Incidentally, I had about 2 cups of the filling leftover, and will plan to mix it with, perhaps, beans or other ingredients for a new dish in a few days. For the future, if I don't want so much extra, I should cut the quantity of the filling. I had some kohlrabi that I decided to cook. It looks a bit odd but is a healthful vegetable to eat. This is what I did. I put all of the ingredients except the onion into my Instant Pot pressure cooker and cooked for 3 minutes on high pressure. After a few minutes, I slowly let out remaining pressure and served; I was going to add the onion - but forgot! 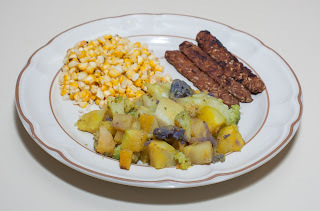 I also made some corn-off-the-cob with a bit of onion and cooked, with no added oil, some smoky maple tempeh on a cast iron pan. The main course was good even without the onion. The beet was particularly good. The kohlrabi didn't contribute much flavor to this dish. I should remember the onion! The cauliflower was too soft and clearly needed much less cooking. 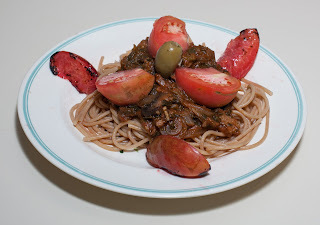 My daughter and I picked up some so-sweet and tasty Sungold cherry tomatoes at our local farmer's market today, and my daughter inspired me to make a simple sauteed seitan dish; I thought as well of adding these tomatoes at the end just for a minute or so. As I was working on dinner, I came up with an easier technique - how about simply pressure cooking? Here is what I did. I put the corn, bell pepper, seitan, marinara, and garlic into my Instant Pot pressure cooker and cooked on low pressure for 2 minutes. After a few minutes, I slowly let out remaining pressure and added the onion and oregano. In the meantime, I had cooked the pasta. I served the cooked sauce atop the pasta, and put a dollop of pesto (an easy no added fat version I recently described) on top of each serving. I served some basil microgreens and an interesting lemon cucumber that we only occasionally have found at the farmer's market (luckily, today we found them!). 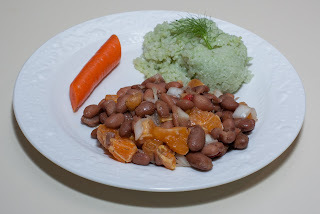 I made a simple dinner tonight, experimenting with combining beans with tangerines. I'm so happy that Pixie tangerines are in stock right now. I made a large batch of cranberry beans for a dish that I was making for a client by rinsing beans, putting ample boiling water on them and soaking them for about 4 or 5 hours, rinsing them again, then adding a vegan bouillon cube and just enough water to cover the beans, and cooking in my Instant Pot pressure cooker for 30 minutes. I gave the pot a chance to cool down so I could open it. I took out about 3 cups of the cooked beans and used the rest for my client. I added to our dish about 3/4 cup of onion, cut to about 1/2" cubes, as well as about 1/2 cup of mixed bell pepper slices, approx. 1/4" x 3/4" in size, as well as about 1/2 t of salt and 1/2 of lemon pepper. I mixed in a cup of tangerine slices (two Pixie tangerines), cut into thirds, and served, along with Jade pearl rice and tomato slices. I made a simple dinner. I cut a full 8 ounce package of tempeh into thin sheets, maybe 1/4" x 1" x 1 1/2" and cut up about a quarter cup of onion into approximately 1/4" x 1" strips and sauteed in a cast iron pan for about 6 or 7 minutes with no oil till the tempeh showed light browning. I then put the onion and tempeh into a shallow plate, sprinkled 2 or 3 T of coconut aminos (or soy sauce) on top, and baked in a toaster oven at 350 degF for about 15m. I also prepared some maifun brown rice noodles by boiling just for a minute or two. I served the baked tempeh atop the noodles for a simple but filling meal. We were a bit low in groceries so I made a simple dinner. I cut up four carrots into 3/8" slices, cut a quarter onion into approximately 1" x 1/4" half moons, and used about a cup of frozen peas. I put them all into a small Saladmaster stock pan, covered, and cooked on medium a few minutes till the vapor release started rattling. I then cooked on low heat, so that the rattling stopped, for about 20-30 minutes. I also cooked, without adding oil, strips of smoky tempeh on a cast iron griddle, as well as asparagus spears. 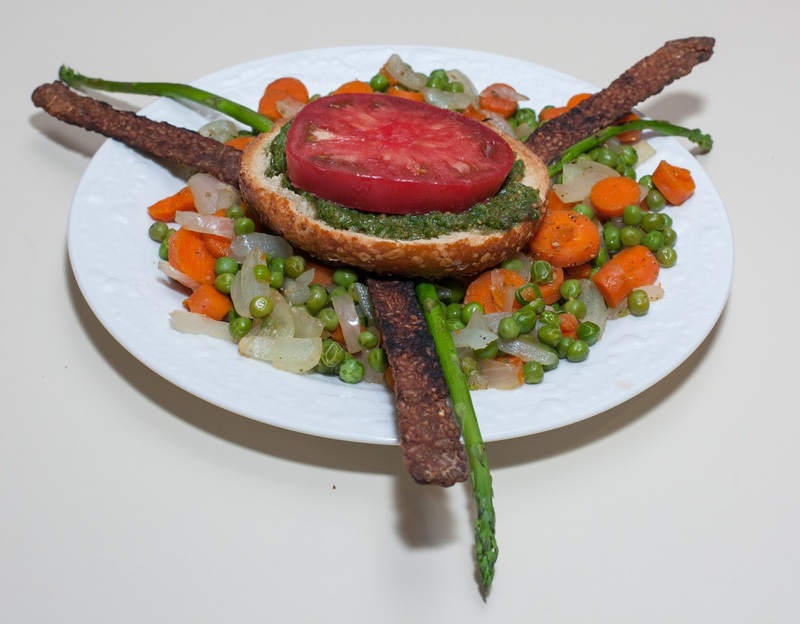 I served a bagel half with some oil-free pesto and tomato slice along with the vegetables and tempeh.